We hardly know about all the features that GA or Google Analytics has as majority of the companies simply use a few tabs and put the rest of them at the back burner. Did you know that URL Destination Goals is one of those goals that is pretty famous but isn’t included as a top priority list for many companies? This can be incredibly vital for chasing your goals in terms of SEO. If you’re someone who has often seen this option but hasn’t invested time to figure out how it works and why it’s important, now is the right time to take on that challenge. You may read on the concerns of this article to know how URL Destination Goals work and how you can use them to improve your SEO performance. How can you set up URL Destination Goals and how do they work? The URL Destination Goals is one of the greatest ways to see whether or not our online marketing efforts are actually offering you any good results. Although there are a wide variety of Goals that you can include but URL Destination Goals is probably the easiest that you can use in order to create the desired online impact. This particular Goal will easily tell you when someone visits a specific page on your website. This even has the capability to gather data which you can later track and determine which online marketing efforts are bringing results and which aren’t. In order to set up a URL Destination Goal in Google Analytics, you need to go to the target website profile in the account of Google Analytics and then you need to click on the Admin button. Under the ‘View Profile’ list, click on ‘Goals’. Make sure that you can create up to 20 Goals. Each profile can have 4 sets of goals, and thereby you have the ability add 5 goals to each set. Also note that Goals can be deleted once the data is recorded. You can deactivate them but once it’s created, you can’t remove them. 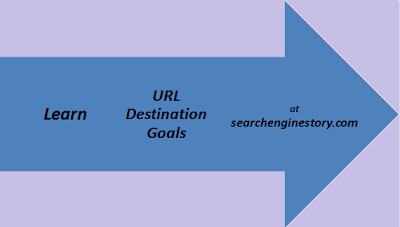 Let’s have a look at the 3 most important things that you can track through URL Destination Goals. 1. Sales: Product sale is perhaps the most important thing to track with URL Destination Goals. If the sale is made on your site through shopping cart, you can easily use a goal funnel to track the progress of the visitor through each and every step of the sale. Even if the sale is made offsite, you can track the journey of the website too. 2. Form submissions: If you’re a service-based business or you earn profits by collecting leads from your website, then form submissions are perhaps the best thing that you can track through Google Analytics URL Destination Goals. 3. Mailing List Opt-Ins: Assuming that you utilize a double confirmed opt-in, there are 2 ways of tracking conversions. You can track the page that you use to redirect visitors and the page when they confirm their subscription. So, with URL Destination Goals, it is certainly possible to enhance your SEO performance and thereby your business profits.